Pecha Kucha is a mix of local creatives sharing their work in rapid fire format. Denver’s second run at this fun event will be held will be tonight, Monday, July 14th at Buntport Theater (717 Lipan Street), 8 PM. There is a $5 suggested donation and beer will be on hand. Pecha Kucha is a mix of local creatives sharing their work in rapid fire format. 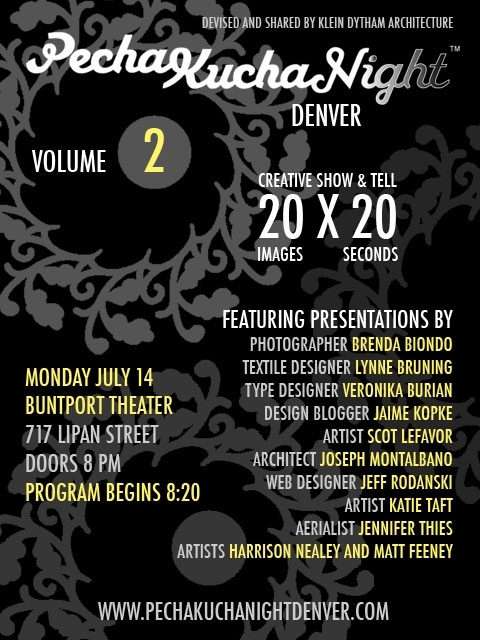 Denver’s second run at this fun event will be held will be tonight, Monday, July 14th at Buntport Theater (717 Lipan Street), 8 PM. There is a $5 suggested donation and beer will be on hand.The Pecha Kucha Denver website has a good rundown of the presenters. I suggest you check it out. The previous event was a lot of fun. I’m so bummed we missed this. J will be presenting at the next one, though!